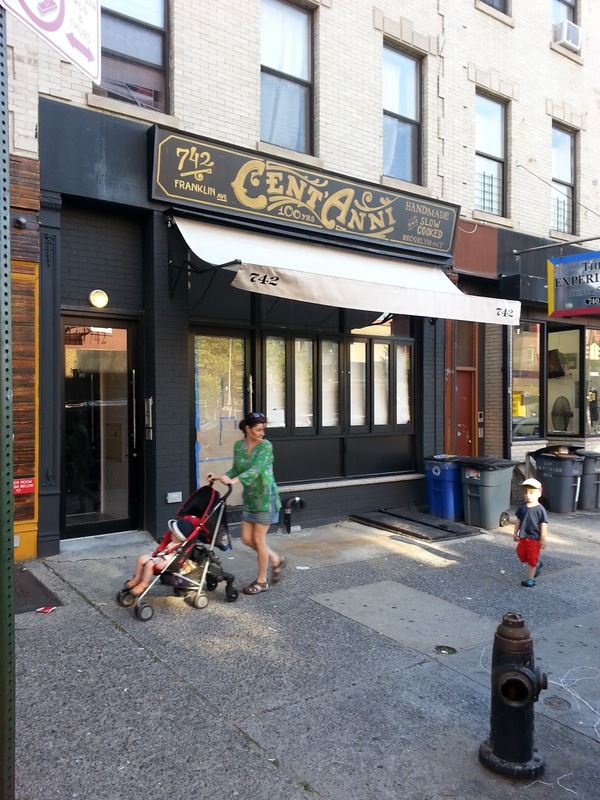 - Cent'Anni, a homestyle Italian place just south of Sterling on Franklin, opened last night. They don't seem to have a menu or webpage or any such things available for linking yet, so we'll have to do this the old-fashioned way. Anybody been in? Thoughts on the food? The service? The back garden (which was one of the reasons the owners/realtors held out for a tenant willing to pay $7,500 a month, from what I heard through the grapevine)? - Pulp & Bean II, across the parkway, is getting ready to open in a few weeks, and they're already hiring. Stop into Pulp & Bean or Bob & Betty's on the north side of Eastern if you'd like to apply. They're hoping to hire locally (here's hoping that other new businesses opening along Franklin will follow their lead). - Finally, Kelso Restaurant, which has operated under different owners on Franklin since 1969, rolled its shutters down for the last time sometime last week, after announcing their plans to do so a few weeks ago. This is sad news, for several reasons. First, the food was delicious (here's their Yelp page, here's ILFA ranting about it, and here's a post from Eating in Translation back in 2008). Secondly, it was affordable; lunch was around $5, a big meal at brunch or dinner clocked in under $10. Finally, Kelso was the last Panamanian restaurant on Franklin, which was once the center of Panamanian immigrant life in the United States. The Panamanian Independence Day parade runs down Franklin every October, and there was even an effort back in 2010 to have Franklin co-named "Panama Way." While the neighborhood was declining as a Panamanian enclave (people moving up and out, etc) long before the current wave of gentrification, and their closing has passed relatively quietly, this would, at some level, be similar to the last Italian restaurant on Mulberry Street closing its doors. I hope they'll continue to host the parade along Franklin. Reports are that Kelso, like many longtime local businesses, was priced out. The same is true for the bodega on the corner of Park and Franklin, whose owners were recently told that they would be replaced, if things go to plan, by a bank branch. Meanwhile, the former Beauty Boutique space one block up is being rented, with the empty lot next door thrown in as a potential outdoor space, for upwards of $12,000. Critics focus a lot on the residential displacement that comes with gentrification, and rightly so, but commercial displacement is connected to residential turnover. Places like Kelso, local bodegas, and salons aren't just retail outlets. They're meeting places and community institutions, sites for social interaction as well as economic transaction, where you might be able to pay tomorrow for what you buy today, or stop and chat with an old friend, or just hang out and wait for the rain to let up. When places like this disappear, the communities that congregated there dissipate, too. None of these changes will surprise anyone who's lived along Franklin for more than a few weeks, of course, and no doubt there'll be several new openings over the next weeks and months to catch our attention and start these conversations anew. But I wanted to pause and mark the closing of Kelso, if only because of its run of over 40 years as an anchor of a community that is passing every day into memory. So many stories about displacement (both residential and commercial) and the problems that come along with skyrocketing rents and price gouging, but never any stories about the causes. I find that to be curious, especially considering the elephant in the room that is leading the charge of displacement and increased rents around here. Is it possible to inform and inspire change without really addressing the sticky issues? Persoanlly, I think not. But I'm sincerely curious about your opinion. I like you as a person, I appreciate and enjoy your blog, I love your care and concern for this neighborhood. At the same time, I know you see more of the full picture than what you put in writing. Why the gap? I write this as I sit and watch the people from the bodega on the corner of Franklin and Park escorted out of the place by police. They came back to get a few personal items that were left behind when they were forced out by the new building owners who demanded $12,000 monthly rent. Those same owners regularly do the same thing with many residential and commercial properties, so often that it's not even a surprise any longer. Yet they go unnamed on your blog. I disagree with this assessment of ILFA. Actually, Nick has done a great job of accessing the reasons behind the changes to the Avenue (& beyond). Perhaps not so much recently, but do a search and go back to entries from 2008 - 2011. (While I miss the old days of ILFA, I also realize that Nick is likely tackling some other writing these days in his graduate program.) Seriously, ILFA has been a remarkable presence in this neighborhood, and kept a continuous conversation about gentrification going over a long haul. Major kudos for that! (And no personal relationship here; I've only met Nick once, long enough to say "I love ILFA!". Thanks Mike for the comments, and Mary for the reply. Mike's right, of course, that I didn't mention MySpaceNYC by name in this post when I certainly could have. 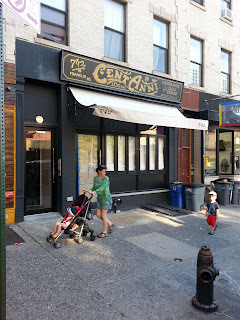 They were the leasing agent for the space now occupied by Cent'Anni, and they're currently redeveloping the Park Place bodega space. I've written about MySpaceNYC before on this blog, as well as the efforts of the Crown Heights Assembly and others (including Mike) to challenge their practices, but I didn't mention them this time for two reasons. First, I wanted to focus the second part of the post on Kelso, and while MySpace has a hand in a lot of the reent turnover, I don't know that they're directly responsible for this particular closing. Secondly, while I've posted and linked a lot of critiques of MySpaceNYC, I'm not actually sure they're the "cause" of displacement. Marshall Berman has a fantastic line about Robert Moses in "All That is Solid Melts Into Air" in which he describes the Moses not as a "power broker" but rather as a particular effective, and at times even unwitting, tool of larger processes. To me, it's sort of the same with MySpace. They've certainly been a major agent of the recent changes along Franklin, and the criticism of their particular practices has been warranted. Still, they're only able to do what they do because we live under a neoliberal urban regime that explicitly incentivizes development, turnover, and displacement, and has since the 1980s (the film "My Brooklyn," which I blogged about back in January, is a nice look at this stuff, and I wrote a review for Dissent about former mayors - linked at right - that talks a bit about it, too). As I've heard others say, "it's not conspiracy, it's policy" - the deck, which is to say the laws and regulations that the city, state, and feds put in place to govern development, is stacked. So yes, we should absolutely call out local realtors when we feel their behavior is anti-social, but we should also situate them within the larger picture, and we should organize to demand that our government, when it intervenes in the market (and it does, every day), should do so in a way that benefits all those who live in New York City, and not just those with $7,000 cash on hand for a down payment (see below). Making these demands requires on-the ground organizing, which I've been trying to help out with a little bit through our Town Halls, etc. Mostly, though, as Mary points out, I've been swamped, and the blog has suffered accordingly. I'm also increasingly irrelevant as a news source, as there are full-time reporters with CH beats now, and I'm increasingly ambivalent about the role this blog plays in the processes of change around me (I don't mean to suggest I have causative power, but I don't want to be an unwitting tool, either). Hence the post you got, which was more of an epitaph than anything else. Mike go keep bothering women !!!! Why dont you tell everyone about about your experience in jail after evicting your own tenant !!!! Excellent news that the area is finally getting a bank branch! No more stupid atm fees. And a great sign of the safety around here. A bank branch would be excellent. I hope the former bodega is big enough to support few tellers, and not just a bunch of ATMs. The growing business community has been clamoring for a local place to get change and do non-ATM transactions. Great article. The changes in the neighborhood are definitely bittersweet. I always have trouble with these changes being called "development" for the community when that community is being displaced. Since this morning, I've heard the bodega won't be becoming a bank. It will instead become an upscale version of a bodega, run by the owners of the building. ...although I remain optimistic that we will get bank in the new building being constructed at the corner of EP and Franklin. Any word on Cent'Anni? That one came out of nowhere. It's delicious, reasonably priced, and my hospitality experience was really great. I'd say it's slightly cheaper than Bar Corvo and very slightly less "gourmet". I think it's a great addition. The new owners of the building on the corner of Franklin and Park are the same ones pushing the displacements and rent hikes all around the neighborhood - MySpace NYC (http://www.yelp.com/biz/myspace-nyc-brooklyn). Are those the kind of people you want to support in this neighborhood? FYI, they also run the new frozen yogurt place near Eastern Parkway. I'd like to congratulate all the people, like myself, who took an equity stake in the neighborhood and are being rewarded with increased safety, many new businesses, and a flourishing new community. Yes, there have been some changes, but change is inevitable. There are other ways to take a "stake" in a neighborhood besides buying property. For example, opening a widely-popular Panamanian restaurant, such as Kelso, which as described in Nick's post, has welcomed neighbors for many years. The comment below me does a good job of refuting the idea that anyone who wants to can take on a $200,000 mortgage (in Crown Heights, where the average HHI *now* is still only about $30k). Love people who congratulate themselves as people who have lived here for decades are being forced to leave because they can no longer afford to rent or didn't have money for a downpayment and were just living here, not looking at their neighborhood as the next hot real estate investment. It isn't all about hot real estate investment, it is about people who just need to rent an apartment as well. If you have the time, look at St. Johns, between Kingston and Utica. You'll see renters who have MORE are moving INTO the neighborhood, while those who have LESS must move OUT. This phenomena will stop when we all have similar incomes and wealth, and apartments are rented and sold exclusively on whether someone can afford a unit. The elephant in the room is the fact that the area is become a lot safer than it ever was - and that's for everyone, the old and new populations. Nick, thanks for your additional comments. Well said, I agree with everything you wrote. Cheers to everyone who are making any effort to build/grow community in a way that incorporates both old and new residents. Development and gentrification may be realties in NYC, but those issues can be handled in ways that help minimize collateral damage. There are problems for sure, but there are also solutions. NEIGHBORS create neighborhoods, support neighborhoods, and protect neighborhoods. Being a good neighbor starts with caring. Actually, it starts with smiling and saying hello on the street - to neighbors of all color, appearance, age, and income. Then you can get to know your neighbors and understand them, which leads to caring about them. Try it, it's awesome. Only when a community binds together as a whole can it effectively address large problems (like MySpace NYC) and make real impacts to fix the underlying issues. It all starts with a smile and a hello. Everyone seems to love the idea that there is a starting point that result in a solution, and a problem that needs (or can be....) addressed. Nostrand Avenue is about to blow up. Nostrand Avenue Pub is packing them in after being open a relatively short amount of time. And on Nostrand south of Eastern Parkway G. Lee's Southern BBQ should be open any day. Hopefully with Nostrand Avenue getting in on things and development going south of Eastern Parkway it will spread things out beyond the Franklin Avenue strip. I'm personally not so sad about bodega loss. When I moved to the neighborhood, there was probably at least one bodega per intersection. We don't need that many bodegas, especially when they're all pretty much the same! On the other hand, I never did take the opportunity to eat at Kelso, and now I really regret it. I wish I had been paying more attention- I haven't been in a while and I would have loved to stop by Kelso's once more before they closed. Their food was great and I loved the family-style environment. They will be missed. Wow - things have really changed in the past 5 decades since, on a dare, I made my 2 year old sister pull her pants down in the freezing cold, as well as "mailing" a cream cheese & jelly sandwich in front of a store on the East side of Franklin Avenue, somewhere around Lincoln or St. Johns Place. We were waiting outside for my mother, I never knew it even happened. I feel that a commemorative plaque is in order! Sorry - make that SHE never knew it even happened. I am happy to say that Kelso Restaurant a Panamanian Institution has new owners and will reopen early September 2013. This is awesome news. Hii..looking for office spaces in Bangalore areas such as office space for rent in koramangala,office space for rent in whitefield. Facing difficulty in finding offices spaces in bangalore then go through this commercial office space for rent in Bangalore,fully furnished office space for rent in Bangalore. thank for the post. :) Good post. Thanks a lot for this wonderful psot i love your work. Wow this is really exciting blog such an awesome one too.